Overview: If you’ve ever fancied yourself as Hemingway or wanted to experience the adrenaline rush of sprinting in front of 3,000 pounds of dagger-tipped beef, you may want to check out Pamplona: Viva San Fermín, a new game from Ghenos Games (imported by Tartan Grizzly), which pits runners against bulls in a race down the narrow streets of Pamplona. Do you have what it takes? Read on for all the gore-y details! Rating: 3 out of 4 hooves. A nice combination of light strategy and trample-your-neighbor. Who Will Like It: Boardgamers who fancy themselves thrill seekers, readers of The Sun Also Rises, Europhiles, runners and others. Components: The heavy duty box is packed with everything you need for a running of the bulls in your own living room. There are four double-sided boards that you’ll use to build each of the four stages, a color-coded runner token, bull and ox for each player, “special” cards, movement cards for both bull and oxen, and a number of tokens to keep track of victory points, tramples and gores. 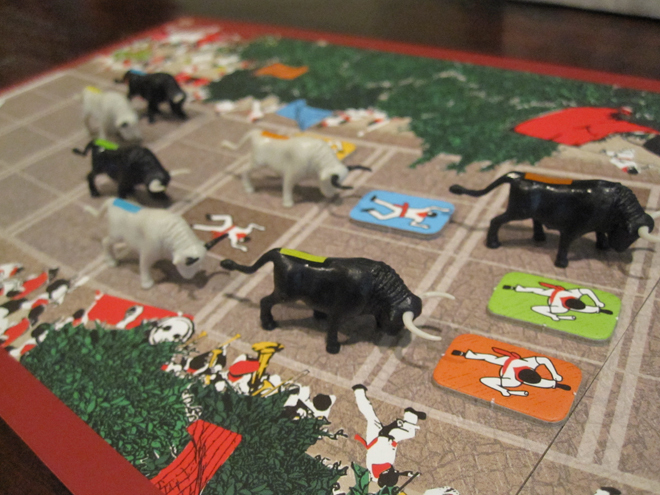 The plastic bulls and oxen are very high quality pieces and show a lot of nice detail, including contrasting body and horn color.Gameplay: Play begins on the first section of board. There are four sections, so match up the two pieces marked “1”. Players are assigned a color and given a runner token, bull and ox for their color. Your goal is to make it to the finish line of each section before all others and to trample or gore your opponents with your bull and ox. 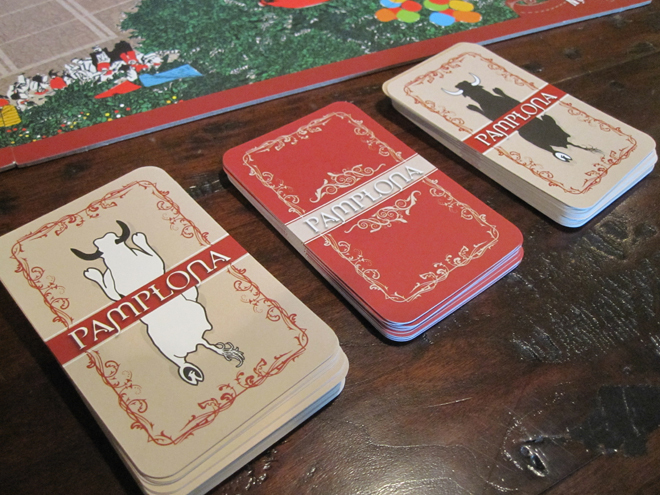 Players are also given a “San Fermin blessing” card and two beer cards to last the duration of the game. The blessing cancels a single goring and each beer card can be used to move the runner three squares or be exchanged for a “special” card. (More on those in a minute.) Each player also draws five bull movement cards (black) and five oxen movement cards (white). Finally, “special” cards are drawn, which give players a unique ability for this particular section. Skills involve super moves, avoiding gores and tramples or tripping an opponent. The track is broken into four lanes and oxen are placed first by selecting a movement card from a hand and placing it on the table. Bulls are placed the same way. The goal of the oxen is to trample runners, while bulls gore them. Movement is always forward, never sideways or backwards (unless a special card permits it) and must be made to an adjacent square. If bulls or oxen cross a space where a runner (either a token or a fallen runner printed on the track board), the bull or oxen must stop. Otherwise, they must move the full distance on their movement card. Runners are placed last and must be placed within five rows of the closest bull. Once the runners are placed, the player closest to the bull receives the lion card if he is directly in front of the lead bull and five bravery tokens (he will also get +3 tokens if he survives the stage). The player furthest from the lead bull gets the rabbit card which subtracts a token point at the end of the section. Bravery tokens are passed out to the remaining runners: four for the second row from the lead bull, three to the next, and so on. Now, the run begins. Runners always move 2 squares, unless a card allows them to move further. Oxen and bulls move next, with players using the movement cards to advance them. If an ox can trample an opposing player, its owner gets a hoof token, which counts as one victory point. (The opposing player can get up and finish the race after the ox gets off his back.) If a bull gores an opposing player, he gets a horn token worth two victory points. Gored players relinquish their bravery points for that round and are removed from the board, but return for the next section. Both tramplings and gorings must be made from squares directly behind runners. Once a segment is run, the setup of picking cards, and placing runners, oxen and bulls is completed again and the next segment is run. After all four tracks have been run, bravery points, horn and hoof tokens are added up and the highest total is the winner. Conclusion: When GeekDad Jonathan Liu came to visit a while ago, we tried playing with two players. It was too easy for the runner to dodge and outrun the bulls and oxen and not that much fun. But when I played later with four players, the street was more crowded, movement was more difficult and the game became much more enjoyable. 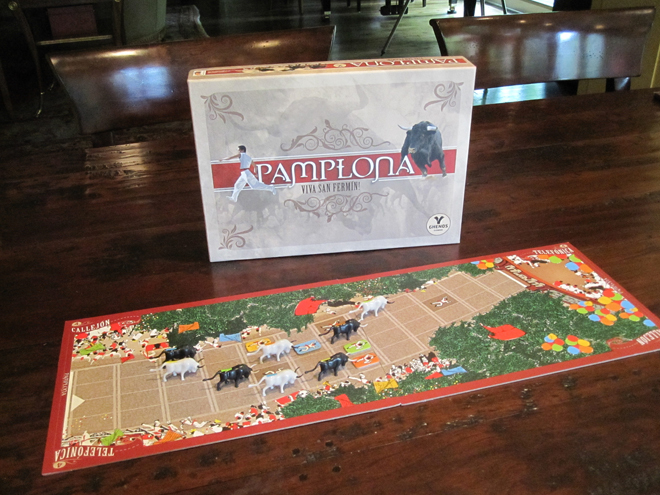 Pamplona is a light strategy game and the special cards throw enough of a wild card into the mix to make it unpredictable enough to give you a thrill playing this game. So pour yourself a carajillo and see if you can outrun the bulls!